We’ve decided, just like last year, to give up a number of things for Lent, not really for religious reasons, but as more of an exercise in self-control. We’re giving up the same things as last year: junk food and sweets/desserts plus red meat and poultry. (Or, as Kim put it so succinctly last year: “No sweets, no meats, no snacks, no quacks”. We added a slight twist this year though, specifically, there will be no cheating allowed. That may sound a bit odd, but when we started Lent last year, we realized that we already had a lot of events planned during which it would have been very awkward to stick to our rules. For example, we had invited friends to join us at a great barbecue place in Brooklyn; it would have been obnoxious to suddenly say “Oh no, we can’t actually eat anything. You all dig in; we’ll just have white bread and stare at you. Enjoy!”. Similarly, we had both chosen the chicken entrée at an awards ceremony we were planning to attend and it would have been a little rude to change our order at the very last minute. As a result, we ended up taking one cheat day each week last year. Through a combination of planning and dumb luck, we have no such conflicts this year, so, no excuses for cheating. The other thing we did differently from last year was to lay out (in a rough way) all of our dinner plans for the next seven weeks (all the days of Lent plus a few days before). Our logic was that if we commit to our plan early and in a concrete way, we would be more likely to stick with it. We turned it into a slightly odd but very fun card game. 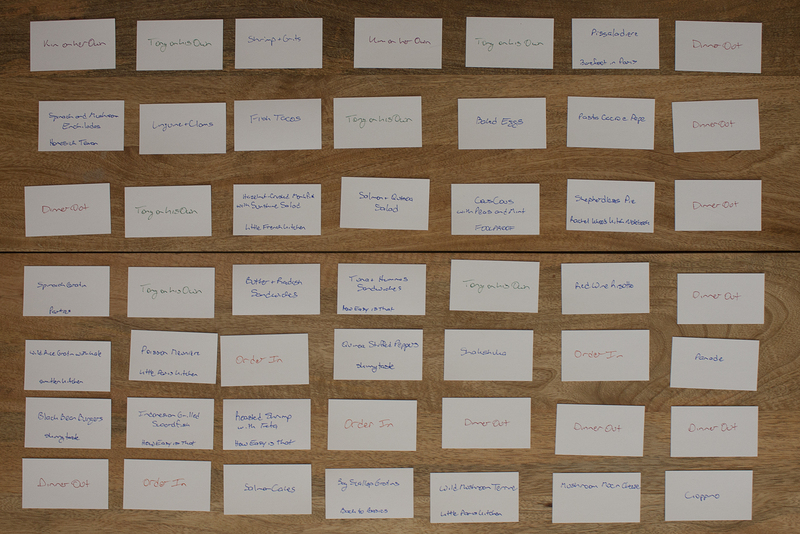 We started with four stacks of “Plans” cards: Tony on his Own, Kim on her Own, Dinner Out, and Order In. We next made a fifth stack of “Recipe” cards, on which we listed all the recipes we want to make during Lent. We then laid the cards out on our coffee table in seven rows of seven, representing all the weeks between this week and Easter Sunday. We started planning for each week using the “Plans” cards and laid them out first. We then filled in the rest of the week with “Recipe” cards, generally reserving the recipes that make enough food so we will have left overs for lunch (like mac and cheese and enchiladas) for Sundays, the seafood recipes for the start of the week, and the hardest recipes for Fridays and Saturdays. We also made sure each week was a good mix of easier and harder recipes. We doubt we’ll stick to this schedule exactly, but it will be very helpful to know we have a plan in place to fall back on.